Dr. G describes a career dedicated to helping people with complex corneal issues attain quality vision. He explains how he started out trying to help patients left with permanent problems after refractive eye surgery. At the time these patients had very few options, and almost no one to turn to for help with their damaged vision. After helping his first patient see again, and witnessing the expression of joy and happiness on the patients face when he opened his eyes and could see clearly again for the first time in a very long time, Dr. G knew this was the area he wanted to focus his career and life work on. 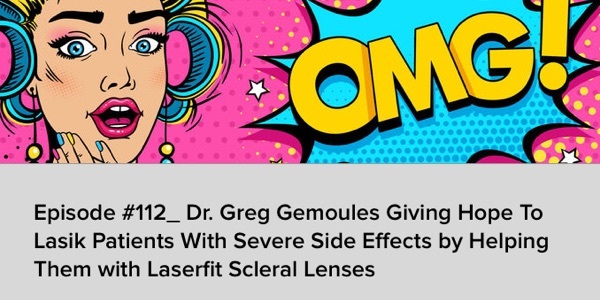 This progressed into a rewarding lifelong career that involved coming up with new technology, patents, and techniques to improve the effectiveness and fit of his custom scleral lenses. Fast-forward to today where Laserfit is considered one of the top destinations in the world for scleral lens expertise. With many patients from all over the globe traveling to get their vision expertly restored. LASIK complications and the importance of research. Jessica Starr and other LASIK / refractive surgery related suicides. Lifelong consequences for patients with severe complications. Importance of hope for patients with damaged eyes. The stages of grief associated with vision loss. The history of Laserfit and technology involved in scleral lens design and manufacture.